Editor's Note: Click the play button to listen to a recently released conversation between hedge fund manager and MacroVoices podcast host Erik Townsend and Hedgeye Senior Macro analyst Darius Dale. Erik and Darius discuss our Macro team’s top 3 themes for 2Q 2018: USA #Peak Cycle; Global Divergences, Reiterated; and U.S. Dollar #Bottoming?. Below is an excerpt transcribed from the conversation. Erik: Joining me next on the program is Darius Dale, Senior Macro analyst for Hedgeye. Our regular listeners know that Hedgeye always sends us a fantastic book of graphs and charts. I highly recommend that you download it as Darius and I will be referring to it throughout the interview. You’ll find the download link in your Research Roundup email. Our regular listeners are already familiar with the process that Hedgeye uses. But for any new listeners, we’ve asked Hedgeye to go ahead and send us the full chart book. So the first 15 or so slides are for reference of any new listeners. Darius, why don’t we go ahead and focus on your three main topics, starting on Slide 18. A lot of our listeners think of your colleague Keith McCullough as probably the most bullish guest that we’ve had on this program. So even Hedgeye is turning bearish in this environment. The first of your three macro themes for the second quarter: Is the USA growth cycle perhaps reaching a cyclical peak? Tell us more about it. Darius: Thanks, Erik. Thanks for having me. I’m a huge fan of the show. I guess before we even get started I just wanted to address the hearsay amongst your listeners. We definitely appreciate the kind words, but within the hallways of Hedgeye, Keith is certainly no permabull. We like to go both ways at Hedgeye in terms of sequencing the cycle, but I would say Keith probably has more of a bearish bias. When he gets out of bed, we kind of have to cajole him a little bit to turn bullish. Fortuitously, we’ve caught some pretty big up moves. Erik: Well, I think that probably the way to describe it is Keith is a very outspoken individual. And the times that he’s been on the show in the past he has been very adamant in a bullish view. And he’s been proven right by the market. So we’ve got to credit him with that. Even Keith McCullough has turned bearish though. So what’s going on with the peak cycle theme that you’re focusing on as your number one topic for Q2 of 2018? Darius: Your listeners will definitely know that what matters most to us at Hedgeye is sequencing the cycle from a second derivative rate-of-change perspective. Particularly keying off of changes in growth and inflation and profits as our key drivers for predicting financial market returns over an intermediate term. And certainly just isolating the US model – our models are picking up on a peak in the year-over-year rate of change in economic growth here in the US in the first part of 2018. We definitely see that developing into a trend lower in economic growth as we progress throughout the back half of the year. So that’s something we think is imputing a fair amount of volatility into financial markets and across asset markets. And we definitely think that’s another factor that’s sort of capped upside in bond yields domestically, which has been obviously taken since consensus positioning, and obviously some pretty big calls by some pretty big-name investors. Erik: And, for any new listeners who are not familiar with Hedgeye’s process, which is actually very involved and very interesting, we’ve discussed that in our prior interviews with Keith McCullough. So if you’d like to hear that information, go back and look for Keith McCullough’s picture on our home page at macrovoices.com. And listen to some of those prior interviews where we get into Hedgeye’s process in detail. Darius, it looks like as we move into Slide 20 or so you’re showing that, boy, we’re here, and it sure looks like a cyclical peak to me. Talk us through the next few slides here. Darius: You’re probably going to hear the word “sequence” from me several times throughout this interview. Because that’s the hallmark to our fundamental process. It really is the hallmark to our entire process. Even if you loop in our derivative market analysis, that really aims to try to identify where investor consensus might be and it might be positioning at the margins. Obviously, with sequencing it matters where you’re coming from and where you’re going. What we show on Slide 20 is that we’re coming from a pretty asymmetric point, from the perspective of our rate-of-change seconder of analysis on when isolating growth is a factor. 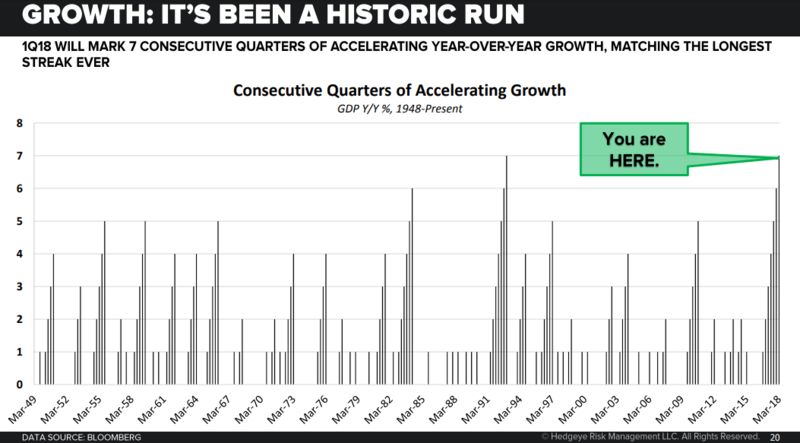 So this chart shows consecutive quarters of accelerating year-over-year GDP growth in the post-war era. And what we learn is that we’re at a fairly asymmetric point in terms of how fantastic this sort of run of growth has been off the mid-2016 lows. If you flip over to Slide 21, we show that same data X-axis here, but what we layer on in this analysis is where realized vol has been, using the S&P 500 as a proxy for risk assets. And we’re at a really asymmetric point in terms of where we might go from here, both from the perspective of the cycle potentially peaking and rolling in rate-of-change terms, but also from the perspective of financial market volatility having a bearish to bullish phase transition that might trend for quite some time from here. We’re just at a pretty asymmetric point. And this really hits the nail on the head as it relates to this Goldilocks bias that investors came into the year with. Obviously, that bias shifted to reflation at the margins, if you look at the CFTC net futures and positioning across the fixed income curves. But both reflation and Goldilocks are counter to a fairly material slowdown in growth and a fairly material slowdown in inflation relative to expectations as we get further into the back half of 2018. On Slide 22 – this deck is a condensed version of our quarterly macro themes deck – what we’ve done here is take a few of the highlight slides and illustrate the point we’re talking about in terms of forecasting a peak and the year-over-year rate of change in economic growth here in the US. 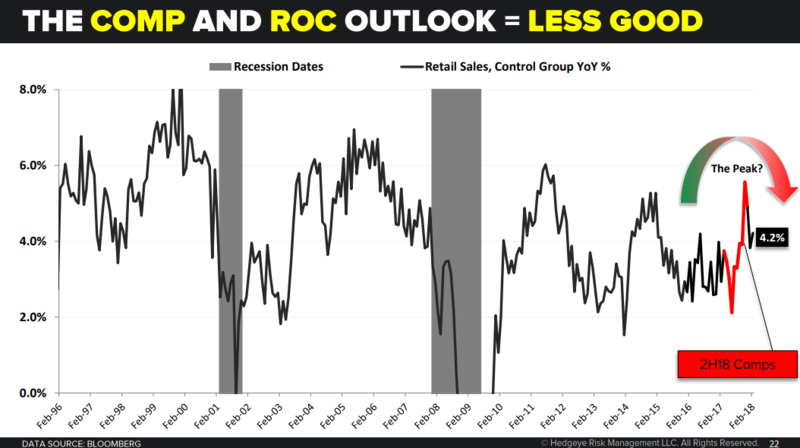 What we’re showing here on Slide 22 is the Retail Sales Control Group. A lot of these indicators, and these are just a handful of indicators – we have a myriad of indicators in the broader deck that all sort of look the same – you have a fairly demonstrable acceleration that persisted from the middle part of 2016 all the way through the end of 2017 or into the early parts of 2018. You’ve seen some fairly steep decelerations from there. And we would anticipate those decelerations really start to trend, particularly as you move into the middle part and the back part of the year where you really start to face peak base effects on a year-over-year basis. A lot of charts on the macro sort of look the same. If you look at Slide 23, luxury goods consumption kind of mirrors the same trend that we see in retail sales. Durable goods on Slide 24, capital goods on Slide 25 – a lot of these charts look like we’re kind of rolling off the top into steepening base effects. So that’s the hallmark of our fundamental forecasting processes. 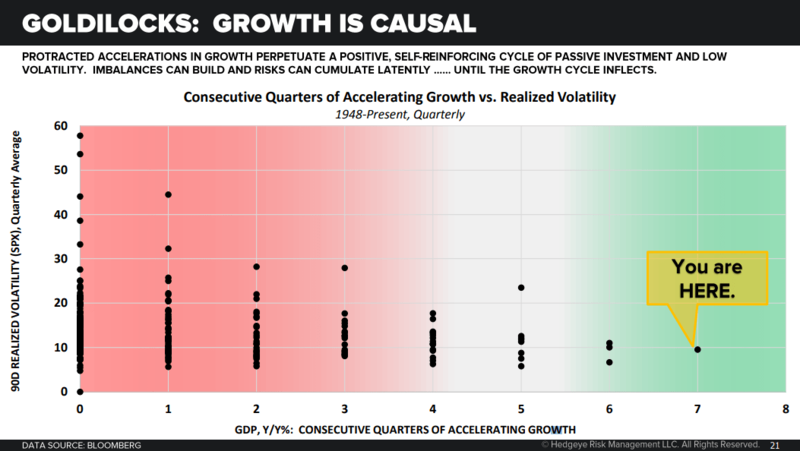 One sequencing the sequential momentum in the indicator, and then overlying a comparative base effect model to understand how the year-over-year growth rates might progress as we progress throughout the year with minimal changes to the momentum. Or we can obviously shock the model with whatever we think might happen. This is pretty standard econometric analysis. And what it tells you is that growth is going to be a lot slower from here, absent a pickup in sequential momentum in the back half of the year. So that’s something we want to call out to investors as a causal factor for why we’re seeing a pretty material pickup in volatility here domestically. Erik: I see that you’ve got a couple of inflation slides coming up. I’m particularly interested because we’ve had radically contrasting views. We’ve had a guest like Julian Brigden come – and Hugh Hendry for that matter as well – come and tell us they think it’s 1965 and that there’s a massive inflation coming. And at the same time Russell Napier just penned an excellent article saying, hey, the US is destroying money supply in the US dollar while other central banks are creating money supply. It has to be deflationary, forget about inflation. It seems like everybody has got radically different views. Where do you guys weigh in on this inflation debate? Darius: No disrespect to your other guests. Obviously, a myriad of very thoughtful very experienced and really sharp investors join you guys on a weekly basis, so I definitely don’t want to disrespect their views. I think there’s a lot of credence to be given to both camps. But the way we think about things at Hedgeye is that it’s not 1960, it’s not 1970, it’s not 2009. It’s 2018. And there are some factors, cyclical factors, that are hard to sequence. But if you wake up early and do enough work, you can get a pretty good handle on what’s going to happen with inflation now, rather than relying on historical corollaries. As we saw on Slide 26, if you think about the progression of inflation over the past 12 months, the risk assets or inflation assets and interest rates have really, really traded concurrently with changes in reported inflation. So we think it’s really important to have a great handle on those near-term changes in reported inflation, obviously keeping in mind what might happen from a secular perspective. 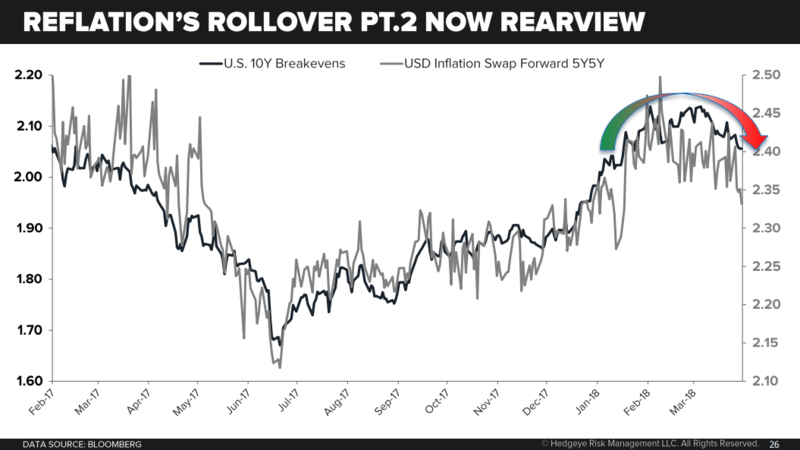 But, again, our job at Hedgeye is to be macro risk managers and not to be prognosticators and people who put these grandiose positions on. We definitely want to help investors manage immediate- and intermediate-term risk, which is where a lot of wealth is generated. 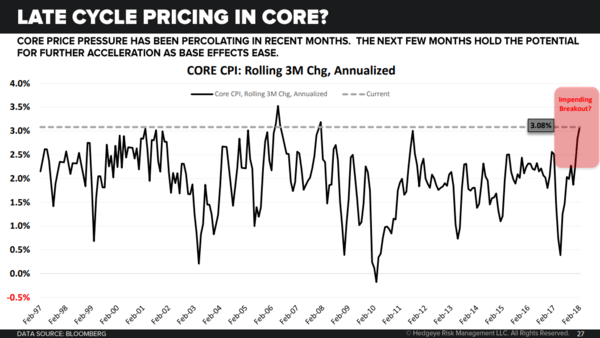 Thinking about inflation more broadly, on Slide 27, one of the things we’re keen to call out is this affirmation of core inflationary pressures domestically. We have some slides in the back of the deck that we can hit on later, showing our labor market analysis, that effectively summarizes our belief that we are getting to the point where you might start to see jump conditions higher and reported wage inflation here in the US. We’re not quite there yet. But as we progress throughout the year , certainly by the end of the 3rd quarter and into the 4th quarter, we’ll certainly be there from the perspective of much faster trending rates of wage growth. 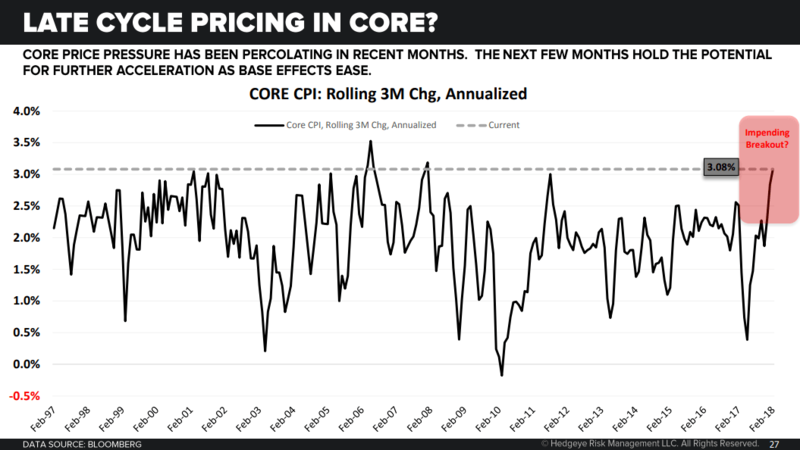 But even now, at the beginning of the year, we’re seeing core inflation start to pick up. So we have a hawkish inflationary bias over the next quarter or two. But we definitely don’t see inflation really moving materially higher from there as base effects steepen. This pretty material downshift in energy inflation that we saw in the middle part of 2017 is something that’s going to provide some uplift to reported inflation here in the United States over the intermediate term. But we wouldn’t necessarily be able to comp to chase that from there, particularly with what’s going on abroad in international economies. But as you get to the middle part of 3Q and certainly into 4Q 2018, we’re definitely well, well below the Street on inflation.